Real de Madrid (Royal Palace of Madrid). 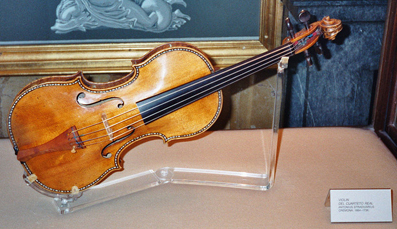 According to the accompanying display card, this violin used to be played in the royal quartet. Stradivarius violins, built by Antonio Stradivari (1644-1737) and his family in Cremona, Italy, are the most famous violins ever created. Merry Company, a wonderful oil painting (on canvas) of a rosy-cheeked happy man and woman enjoying each other's company, drinking and enjoying music. The man is singing and accompanying himself on a violin and the woman is raising a glass of wine and is about to drink the man's health. 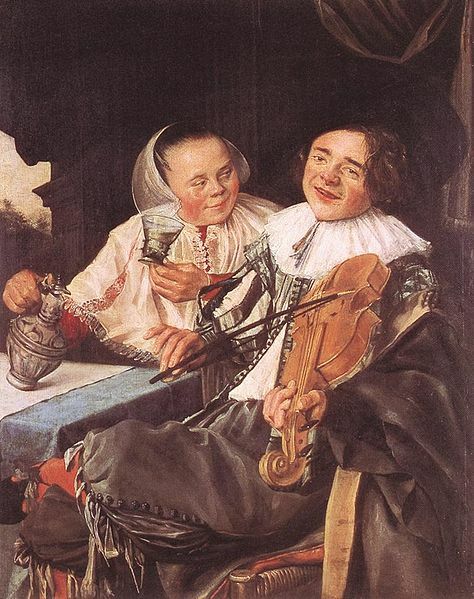 This painting was done in 1630 by the Dutch painter, Judith Leyster (1609-1660) who was active during the Dutch Golden Age. She was a colleague of Frans Hals, who painted The Laughing Cavalier and Gipsy Girl. The above painting (also known as The Happy Couple and Carousing Couple) is currently located in the Louvre Museum, Paris, France. 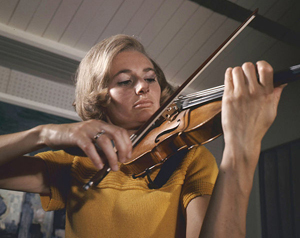 Note: This picture gallery page features photos (photographs) of violins, plus drawings, paintings, diagrams, images and illustrations of them.